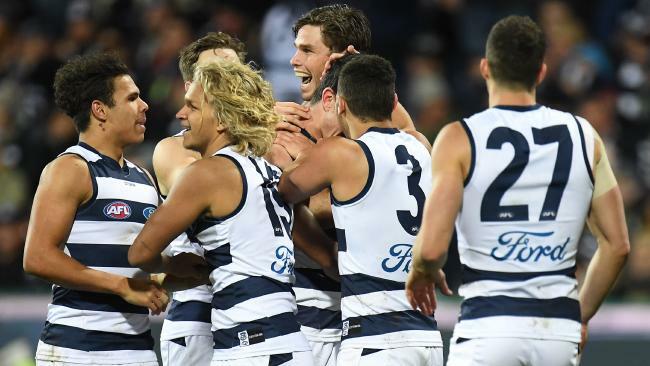 GEELONG has set the stage for "something special" with its two-point after-the-siren win over Melbourne on Saturday night. Cats coach Chris Scott - who famously did not watch when Harry Taylor took his kick after the siren against the Western Bulldogs last month - brought himself to be fixed on defender Zach Tuohy as he booted the winner at GMHBA Stadium. And he said that the come-from-behind victory showed a mettle that can't be manufactured. "It was a real credit to the resilience and the fight in the group," Scott said. "There would be occasions where teams are in that situation and they turn up their toes. You can't say that about our group at the moment. And I would have been saying that even if we didn't get the result. "It does set you up for something special if you have that in a group. It's very hard to manufacture if it's not there organically." The Cats trailed by as many as 31 points in the last quarter before surging home to a crucial victory to their finals hopes. 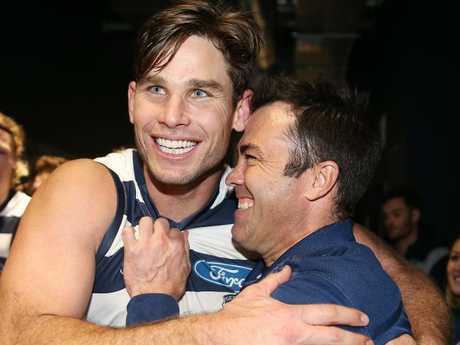 Tuohy's presence in attack was the result of some pushing from defensive coach Matthew Scarlett, Scott said, who backed the Irishman to give the Cats some X-factor up forward. But it was the midfield trio of Patrick Dangerfield, Gary Ablett and Joel Selwood's ability to step up - alongside Tom Hawkins, who celebrated his 30th birthday in style with seven goals - when it mattered that Scott described as "supreme". Ablett's blistering final term - which included 14 disposals, seven of which were contested, two clearances and two tackles - showed "that he wants to win". "He loves playing with this group," Scott said. "We have a group of players at the moment that love playing with each other. 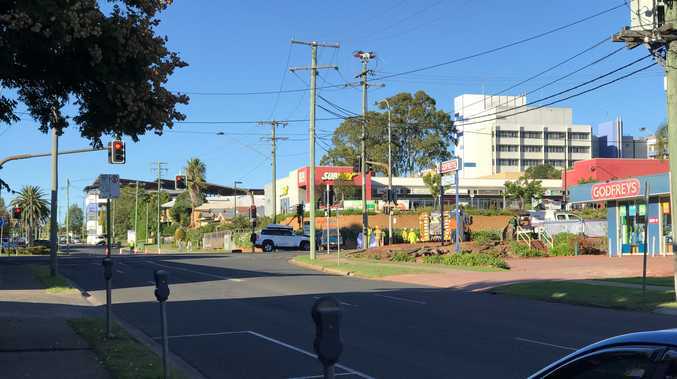 We're not always getting it right at the moment, but when we do, it's not difficult to generate enthusiasm when you have a group that have a lot of care for each other." The victory consolidated Geelong's September aspirations, which Scott said would be particularly boosted by the final quarter comeback. "Even if we didn't get the result, it would have spoken to the care that the players have for each other and the fight that's in this group," he said. "It's clear that every team without exception is going to have to fight and scrap if they want to achieve the ultimate, because the competition is so close. "The results of this round have proven you need to be on, or you'll get beaten. With not many games left … we're aiming to use that last quarter in particular and build some momentum and build our form. If we could bottle the way that we played in the last quarter, we'd be very hard to beat."